Super Hero Boy: Wow Toys continues to inspire us! Wow Toys continues to inspire us! Its no secret that I love toys with no batteries. They appeal to my husband's thrifty side as well, batteries are downright expensive at times, and if you have ever had to do homework with a two year old in the same room you would understand my elation. I try to get this point across to so many of my friends with kids with the exact same response : "Doesn't Connor get tired of them since there is no action?". HA! Sorry I just can't help to laugh at that one. No one would ever in a million years suspect that our collection of Wow Toys are not only some of the most durable toys we have ever played with but they are 100% battery free. Connor has more toys than he knows what to do with, and yes even ones with batteries, but more often than not his little line of Wow Trucks are usually the ones left in the living room after a long day. Connor is only allowed a small number of toys in the living room at once to try to control the mess and he usually thinks long and hard about what he wants to bring out. Tonight I found his Wow Trucks all neatly lined up against the living room wall after he went to bed. This is a sight that's quite often around here. Our newest member of our Wow family is Harvey Harvester. We've actually had Harvey for a few months and he's been a great addition to our collection. Harvey is actually pretty unique as I can't say I've seen a ton of harvester toys. Harvey has several cool functions that keeps Connor really entertained. The first is his really unique hay baler. Harvey comes with several little hay bales which you can drop into the slot on top. As you move Harvey along the floor the bales pop out the back just like they would do with a real baler. If you don't roll Harvey along the floor the bales won't come back out. 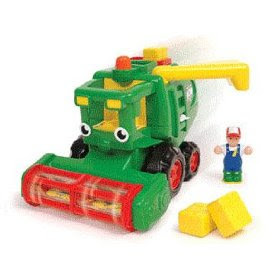 This makes it a bit more realistic and it gives younger children an incentive to keep him moving.. As well the grain harvester on the front spins and rattles around the grain inside so it really does look and sound like he is harvesting when you move him around. One of my favorite aspects about WOW though is the fact that all their toys are compatible. We own several vehicles and Connor loves to interchange the people and animals between the vehicle. I had to laugh as yesterday I caught Connor with his new Best Buddies Dragon in the roof of our WOW Police car which is usually where the Police dog sits. Connor's daddy is a police officer and I'm pretty sure he'd be pretty excited to have a dragon as a partner. Actually I had to laugh as the knight is busy driving the garbage truck tonight as well. I mean what else is a knight supposed to do with his time in the modern world? heh. The Best Buddies collection is actually a new edition to the WOW toy line and comes with a person and buddy in each pack. Connor has the knight and dragon combo but you can get lots of cool editions to your WOW family including a police officer and dog and a princess and a unicorn! I'm really excited to say that WOW provided us with an extra Best Buddies pack to give away to one lucky reader. I'm going to keep a secret as to which Buddies it is just to keep this a bit interesting. They would make for perfect stocking stuffers! Leave a comment on this post. Visit the Wow Toys website and check out the Best Buddies collection. Come back here and tell me which buddies set you think we are giving away! This contest will end Nov 15th at midnight! Could it be the firefighter and cat? I think you're giving away the off road ollies outdoor pursuit set. Thanks for the chance. My guess is that you are giving away the police man and the dog. These are too cute and I think my little guy would LOVE them. I'm a subscriber to the newsletter! The eskimo and the polar bear! I think that you are giving away the knight and the dragon. Whichever of the sets it is, I know that my three year old grandson will just love these. I really like the spaceman and the alien because Grandma likes anything to do with space. This is Number One post of the Extra Credit. This is Number Two post of the Extra Credit. This is Number Three post of the Extra Credit. The knight and the dragon. My son would love any of these! I would pick the fireman and the cat. My son would love that! It has to be the Best Buddies Christmas. I would say Santa and the Reindeer. I guess policeman and dog! I am guessing the policeman and the dog set. I guess is the policeman and his dog. I love the little red motorcycle with the side car. I couldn't download the PDF but it was in the Holiday travel section. I like the princess and a unicorn. I love the astronaut and the alien! I think it will be Bumpety Bump Bernie. The fireman and the cat. My guess is the Eskimo & Polar Bear! Katie Camper's Holiday Friends? I really like it. The Eskimo and Polar Bear!! If not, then I still think it's cute. 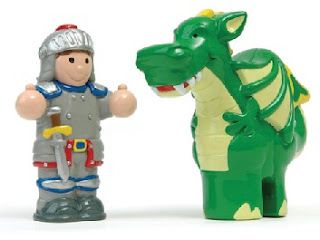 I think you're giving away the knight & the dragon! I think that it will be the policeman and dog.